Sweeping your private keys means to send all the bitcoins that can be unlocked by those private keys to an address in your existing deterministic Electrum wallet. It is a one-time on-chain operation that will cost you transaction fees. The address displayed in the window above by default will be an address in your wallet. This is where all the funds will be sent. Your private keys need to be in Wallet Import Format (WIF) or mini private key format. These are standard formats for private keys. More about that here. 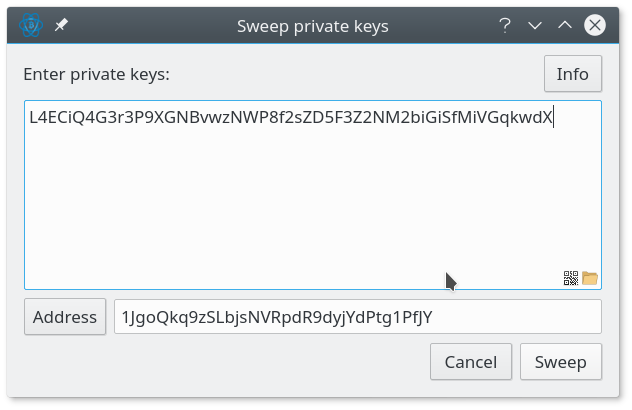 Note: if the addresses in the originating wallet of the private keys begin with 3 you have to prepend “p2wpkh-p2sh:” to each private key before sweeping it. If the addresses begin with bc1 then you prepend “p2wpkh:”. Click on the info button to see examples. Click on sweep and electrum will look up what bitcoins have been sent to the corresponding address and display the send tab because in effect you are sending the coins to an address in your wallet. You can customize the fees for this private key sweeping transaction using the send tab and then click on send to do the transaction. What does it mean when it says the sweep is “unconfirmed”? Does this mean I have to wait a bit for it to go through? My coin appears in my new Electrum wallet but it’s also still showing up in the old multibit wallet too. It means your transaction hasn’t been incorporated in the blockchain yet. That happens within 10 minutes to an hour so it should have happened by now. Hi, i’m trying to sweep a Pandacoin paper wallet I was given into Electrum, but the sweep button is greyed out. Can i use Electrum for Pandacoins? if not, is there another wallet you would recommend for this? Thank you for these very good info pages! Keep up the good work! I have some BTC in “behind physical coin” (bought from Denarium) so I have a my private key on physical hologram paper. My idea is to get those BTCs to my Electrum Wallet. Problem is that when I try to “File -> New/restore -> wallet name and OK -> standard wallet and Next -> Use public or private keys and OK -> .. The “Next”-button does not activate even if I put the correct private key. It is 30 digit long, and I do not know what “xprv/yprv/zprv” means – I have just put the 30 digit private key there. So that is my showstopper 🙂 Any help? OR instead of above – can I just use this “Sweeping” -option? I’ll get my BTCs to Electrum via that way also? I made a huge f*!k up. The BTC address wasnt visible anymore after a JAXX update. The 12 word phrase didn’t work either. So I tried to upload the funds with my address and privatekey at Electrum. I used the function sweep privatekey and filled in the required fields (I thought) and pushed BROADCAST. DAMN IT what an high fee! And now the most stupid action. I filled the same address as where I was sending from. So $450 gone with a useless action (0.55 -0.045 fee!!) I was sick of it! Its in my wallet now.. I am just a moron lol. first mistake and the last one i hope. See the “note” in the article above. You probably need to specify the script type for each private key.